'A Special Treat for Little Ladies': Whatever Happened to Tinkerbell Cosmetics? 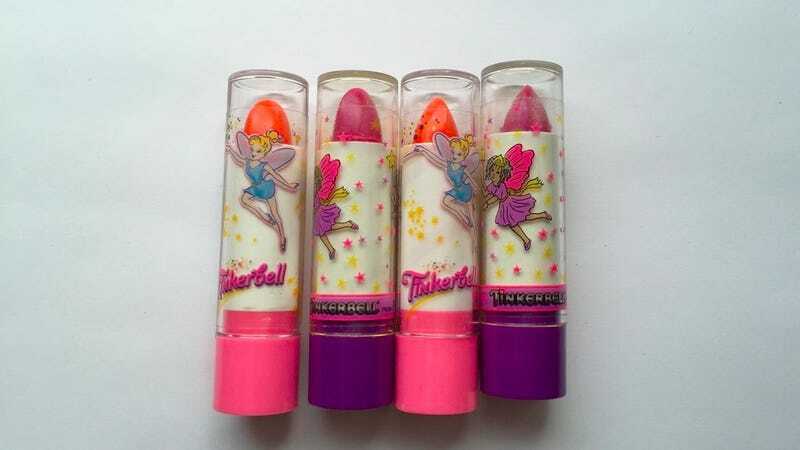 One of my most vivid early-childhood memories is browsing the Tinkerbell Cosmetics section at some department store. I’m speaking, of course, about the play makeup products for girls younger than ten, featuring a logo with bubble letters—not to be confused with any of the many offerings that’ve been emblazoned with the pixie face of Disney’s Tinkerbell. The Fisher Price kitchen of cosmetics. I must have wandered a short distance away while my mother shopped; I looked up and saw hot pink stretching for feet over my head. But of course, plenty of products were sitting at eye-level for me to grab and turn over in my hands, examining the mascot, a sort of cheeky-but-relatable fairy with a spiffy wand. The peel-off “nail polish” was probably their most popular product, but what I remember best are the little change purses, hot pink and satisfyingly plastic. It must’ve been my first proper shopping experience, scaling the adult world to a child’s level. Nor was I the lone enthusiast. The brand has gotten the BuzzFeed Rewind Treatment treatment multiple times. There are homespun tributes scattered across the Internet—a Blogspot here, a Blogspot there. My research uncovered a Tinkerbell Caboodle and a set of bath bubbles priced to move at $49.25 on Ebay, as well as a “VTG Tinkerbell Cosmetics Coin Change Purse Adorable RARE” for $20.99. If you’re really dedicated, you might want the “sparkling fairy dust” going for $45. The flame is being kept alive most diligently at—of course—Pinterest. It is only as a grown woman that I look back and wonder: What the hell was that all about? The answer is almost too stereotypical to be true! Tinkerbell Cosmetics were the work of Tom Fields Ltd, a company founded in 1952. Ayup—smack in the middle of the baby boom, just as American society had finished hustling all those women who’d gotten jobs during World War II back into the kitchen and plying them with New Look-derived wasp-waisted fashions, somebody debuted a line of play cosmetics for kiddos. If you have a little girl in your house, you know how utterly fascinated she is in the various cosmetics you use. At some time or other she has probably dabbled in your nail polish, smeared powder on her face, or spilled your favorite perfume. It’s only natural for little girls to be interested in such feminine activities. Instead of reprimanding her, the logical move is to provide her with suitable toiletries, created specifcally for a budding glamor girl. Perhaps she is a nail biter, or a reluctant bath-taker. If so, a package containing some nail polish (clear or pale pink), polish remover and hand lotion will undoubtedly encourage her to overcome the nail-biting habit. The company even had Miss Tinkerbells who’d do official meet-and-greets with fans at “cosmetic parties.” From the Milwaukee Sentinel, 1959. Tinkerbell’s conservative sales approach, though, is now under increasing pressure from tough new competitors. Major toy manufacturers, including Mattel, Remco, Ideal, Hasbro and Mego, have introduced broad lines of make-believe makeup. Toy and Hobby World magazine lists Remco’s Crayon Children’s Play Cosmetics as currently the top-selling brand. Remco also tempts the tots with Blue Ice Eye Shadow and Sweetheart Pink Lip stick. Hasbro offers a Fresh ‘n Fancy kit that allows the girls to mix their own makeup colors. Until now, 20-year-old Johnson & Johnson’s No More Tears shampoo has had the kiddie hair-care market cornered, and Tinkerbell play cosmetics, founded 38 years ago by Tom Fields, has been the leading name in kiddie-safe nail polish, fragrances and so on. But now, with yuppies attempting to elevate parenting to an art form, giant cosmetics companies like Estee Lauder and French couturiers including Hubert de Givenchy are putting their names on luxury grooming lines for children, gambling that parents will be willing to spend extra dollars for pint-sized prestige items. The AP was even more alarmed: “Kiddie cosmetics are here. They’re a long way from Tinkerbell’s “let’s pretend” cosmetics introduced in 1952 to help keep little hands out of mother’s potions. They’re for real.” And my favorite, the Dallas Morning News, 1998: “Once, kids’ cosmetics were limited to Tinkerbell bath powder and wash-off nail polish from the toy store.... Today’s Spice Girls generation uses glitter on eyelids and colored mascara in hair, and paints fingernails shiny green or blue.” From Tinkerbell to the Spice Girls—generational panic perfectly encapsulated! It’s a funny little dosie-do, really. Inculcate little girls with the importance of growing up into appropriately “feminine” women who wear Revlon Snow Peach, but they shouldn’t start applying the real thing until the perfect moment. The owners of Tinkerbell tried to play along. Tom Fields rolled out another line, Demoiselle, described by the San Francisco Chronicle in 1990 as “slightly more sophisticated” than the flagship and boasting lipstick and blush. Another ad from the period touted Tinkerbell as “the next best thing to a hug.” A pretty childlike pitch, still. As many women of a certain age will testify, Tinkerbell was still very much a childhood preoccupation at this point. (Those peel-off nail polishes! The branded Caboodle!) But even as I stood in that department store, bowled over by all those brightly packaged cosmetics, getting my first taste of the Sephora phenomenon, the brand was approaching the end of the line. At your mall now: Bronzed Babe Lip Gloss and Sparkle On Scented Body Glitter for girls 7 to 14 from the Limited Too clothing chain, along with Smackers Make Your Own Wearable Lip Gloss (age 7 and up) and Nail Art for girls (6 and up) from, of all places, Zany Brainy, the educational toy store. Tinkerbell Cosmetics was a pioneer of makeup for little girls in 1952. Today the market is huge. Consider that there are some 28 million “tweens,” or children ages 8 to 14, according to MarketResearch .com, a marketing information firm. In 1999, they spent more than $9 billion on personal products, says the Marketing to Kids Report, an industry newsletter. And so at some point, the brand simply faded out. What’s more, it was before the advent of the mass-market Internet, so it didn’t even get a frantic sendoff like Bonnie Bell’s original manufacturer. If you go searching for “Tinkerbell” online, you’re far more likely to uncover bright green makeup tutorials associated with the Disney character. So long, Tinkerbell. Thanks for the lifelong addiction to bright pink packaging. Scans via Google Newspaper Archive; Color images via Ebay.